South Carolina flood is just the latest 1,000-year rain event in the U.S.
Over the weekend, South Carolina was deluged by record-setting rainfall. So much rain pummeled the state that at one point officials estimated that more than half the state was flooding. 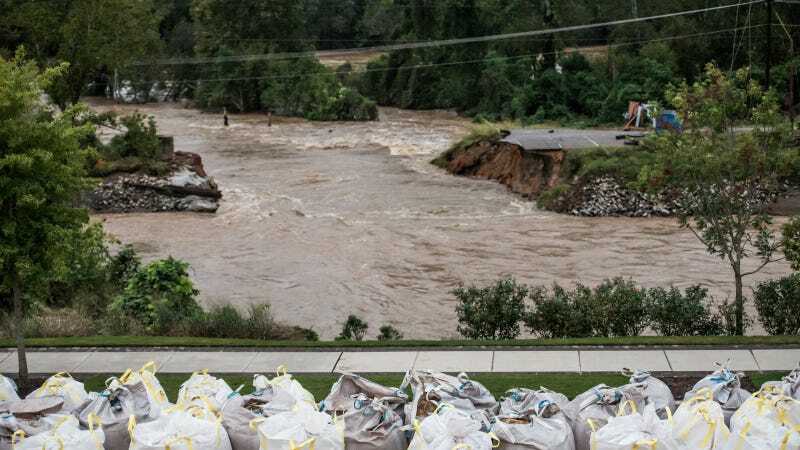 More than 20 inches of rain fell in three days in the central part of the state, according to the National Weather Service, and at least 13 people were killed. On Sunday, South Carolina Gov. Nikki Haley said "we are at a 1,000-year level of rain. That's how big this is." This statement doesn't mean that the type of rainfall event is expected to occur every 1,000 years, but that there's a 1-in-1,000 chance of it happening in any given year. Put otherwise, the recent flooding in South Carolina has a 0.1% chance of occurring in any year. According to The Associated Press, South Carolina's flooding is at least the sixth 1-in-1,000 year rainfall in the U.S. since 2010. Steve Bowen of Aon Benfield, a global reinsurance firm, told the AP that the other events include Tennessee floods in 2010, Hurricane Irene along the Mid-Atlantic in 2011, epic flooding in Colorado in 2013, Maryland floods last year, and recent flooding in Nebraska. "We have certainly had our fair share in the United States in recent years, and any increasing trend in these type of rainfall events is highly concerning," Bowen said. Jayme Laber, a hydrologist with the Los Angeles office of the National Oceanic and Atmospheric Administration, told the Los Angeles Times that in the L.A. area, a 1-in-1,000-year rain or flooding event hits “pretty regularly” somewhere in the Southern California region, even if only for a brief burst of rainfall. He said that in 2011, the Palmdale region was in a a 1-in-a-1,000-year event that led to extensive flash flooding. Scientists have been trying to draw attention to the link between climate change and the increased likelihood of heavy and intense rainfall. The recent National Climate Assessment found that global atmospheric warming would bring about more extreme rainfall events, a trend already being observed in the U.S. The map shows percent increases in the amount of precipitation falling in very heavy events (defined as the heaviest 1% of all daily events) from 1958 to 2012 for each region of the continental United States. Of the South Carolina flood, Michael Mann, director of the Earth System Science Center at Pennsylvania State University, told the Guardian that “this is yet another example, like Sandy or Irene, of weather on ‘steroids’, another case where climate change worsened the effects of an already extreme meteorological event." One of the most straightforward responses to climate change is a quickening of the hydrologic cycle: Warmer air speeds evaporation and can cause rain to fall with greater intensity. This supercharges the atmosphere, and boosts the likelihood of devastating floods. To see a fascinating visual of how the rain developed over South Carolina, watch this NASA video of a satellite tracking Hurricane Joaquin. Correction: the percent chance that South Carolina has of experiencing a 1,000-year flood has been updated to 0.1% in any given year.